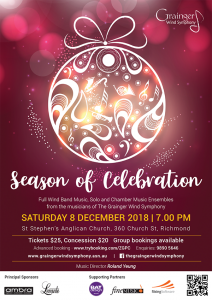 Our final concert for the 2018 Season of Celebration is on Saturday 8 December 2018 in St Stephen’s Anglican Church 360 Church Street, Richmond. Symphonic Suite from Star Wars Episode III Revenge of the Sith by John Williams arranged Robert Smith. Trombone Quartet – Peter Chaplin, Andrew Peters, Dale Wescombe, Joshua Anderson.